Seven years after Tung Chee-Hwa fell from grace, C.Y. 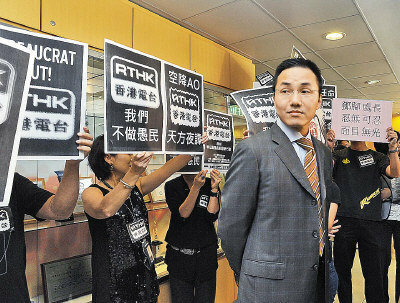 Leung finds himself in eerily familiar territories. The only difference between the two beleaguered chief executives is that one of them has only been in office for a hundred days. Leung, a self-professed retail politician who ran on a popular platform to tackle the city’s growing income gap and runaway property prices, is coming undone. Nothing seems to be going his way. 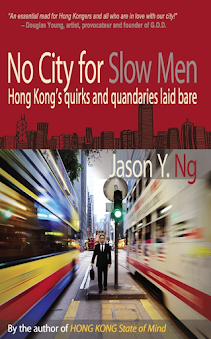 First, his cabinet reshuffle was derailed by filibusters at the Legco. Then, one of his ministers was caught cheating government housing allowances and had to resign just twelve days after he took office. Next came the national education debacle, which had snowballed from a loosely organized student protest into the biggest political crisis since the anti-subversion bill controversy in 2003. All of his other policies, including the northeast New Territories development plan, the old-age allowance scheme and even something as mundane as building a man-made beach in Tai Po, have been met with massive resistance. 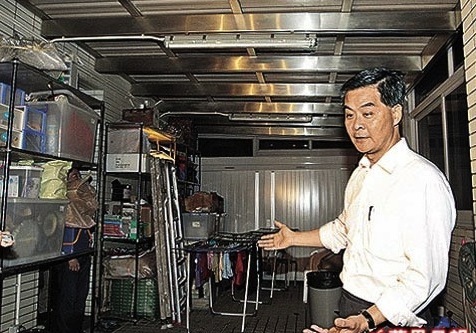 Leung seems to possess the “Sidam Touch,” the ability to ruin everything he comes into contact with. The performance of a political leader is often measured by his accomplishments during the first hundred days in office, when he has the most political capital at his disposal. Judging from C.Y. Leung’s first hundred days, his administration is shaping up to be as disastrous as Tung Chee Hwa’s, if not more. Conscious of his own failures, Leung attempted to reboot his term with a campaign called “Hundred Days’ Reform” (百日维新), borrowing the name from the famous national movement in China during the late Qing dynasty. But when he realized how unlucky it is to name a campaign after an event in history that ended in failure and almost got the organizers beheaded, he decided not to tempt fate and drop it altogether. Though if Leung really wants to be superstitious about things, he should blame his miserable first hundred days on an inauspicious start. His reversal of fortune began shortly after he won the election, when a half-dozen illegal structures were discovered at his residence on the Peak. It wouldn’t have been such a big deal if Leung hadn’t attacked his opponent Henry Tang so mercilessly during the election debate for committing the very same crime. The city was so outraged by his hypocrisy that critics called for his impeachment even before he was sworn in. Very bad luck. "I have no idea how the storeroom got here!" Politics superstitions aside, the illegal structure saga underscores C.Y. 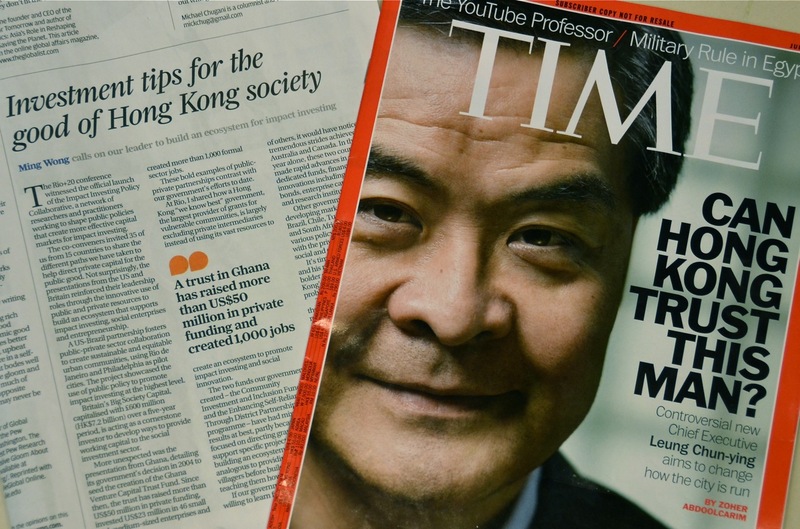 Leung’s biggest problem: credibility. All the lies and half-truths he told to cover up his building violations play into the perception that the man nicknamed “werewolf” is a compulsive liar and a ruthless opportunist. Indeed, trust has always been his Achilles’ heel. Throughout his political career, Leung has been dogged by rumors that he is a closet communist. During the chief executive election, his close ties with the Liaison Office (中聯辦), the de facto Chinese consulate in Hong Kong, made him look like a sell-out and raised suspicions that the two are in cahoots to “Sinofy” the city. 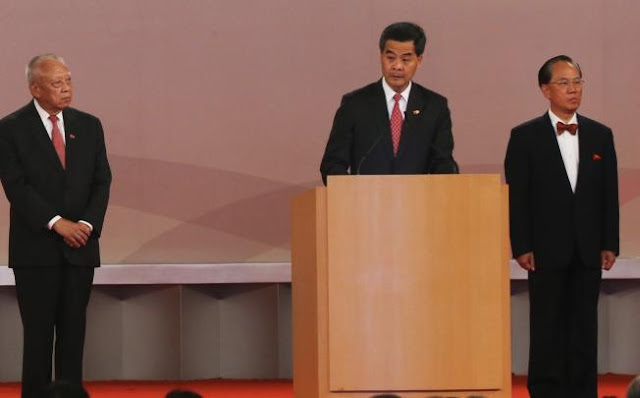 So far, Leung has done little to bridge the trust gap. On the contrary, his credibility problem has been spreading like a cancer. It has infected his government and poisoned every policy initiative it puts forward. Meanwhile, Beijing is keeping a close eye on C.Y. Leung’s every move. After all, the Politburo took a chance on him when he was still an underdog running against establishment candidate Henry Tang. When Tang’s election campaign began to implode in the weeks leading up to the voting day, Beijing took the Liaison Office's advice and backed Leung. With the 2017 deadline for universal suffrage in the city looming, the Politburo needed a strong man to finish what his predecessors have failed to do. 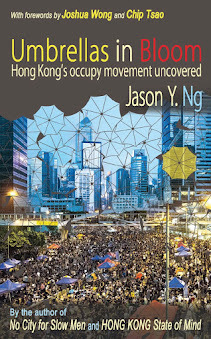 They needed a leader with enough popular support to push through an ambitious political agenda in Hong Kong. Dubbed the “Four Great Tasks” (四大任務), the agenda includes: (1) passing the anti-subversion bill (also known as “Article 23”), (2) reorganizing RTHK (a government-funded radio station), (3) implementing the national education curriculum and (4) writing the rules for a Beijing-friendly version of universal suffrage. Task No.1 failed in 2003 after half a million angry citizens took to the streets demanding Article 23 be scrapped. Tasks No.2 got done during Donald Tsang’s term, after the government went through a sham recruitment exercise and replaced RTHK’s head with one of their own. That means by the time Tsang left office this July, three of the four Great Tasks remained outstanding. That’s where Leung is supposed to come in, as the Great Helmsman who will step up to the plate and check things off the list. At least that’s the way the Liaison Office sold the candidate to Beijing during the chief executive election. Three months into his term, however, Leung turns out to a big disappointment. With national education now dead in the water and his personal credibility out the window, there is little chance that anything will get done in the foreseeable future. Tough pills like Article 23 and election reform appear out of the question. As if that wasn’t bad enough, C. Y. Leung made a catastrophic mistake two months ago that would reverberate far beyond the confines of our city. 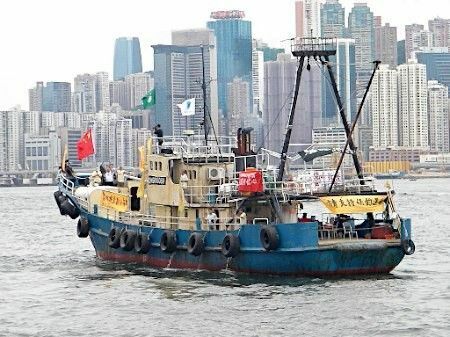 In August, a Hong Kong fishing boat carrying a half-dozen activists set out to the East China Sea. They dodged the Japan Coast Guard and landed on the disputed Diaoyu Islands. The incident set off a new wave of territorial disputes between China and Japan, and threatened to set Sino-Japanese relations back four decades. It is the last thing that Beijing needs when they are still cleaning up the Bo Xilai (薄熙来) snafu to make way for the all-important leadership change in November. It being a Hong Kong fishing boat, however, all fingers are pointing at Leung. 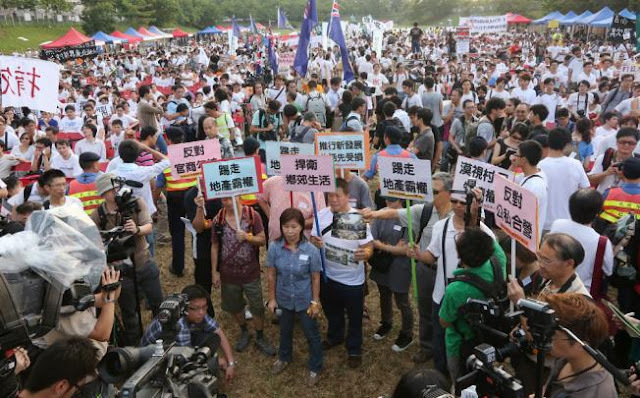 It appears that the chief executive received conflicting signals from Beijing and followed the wrong marching order. He should never have allowed the fishing boat to leave Hong Kong waters and let home-grown activism get out of hand. Therein lie the perils of taking orders from up north, especially in the lead-up to the 18th National Congress (十八大) when there is so much confusion and factional in-fighting: you just don't know whom and what to believe. As far as Beijing is concerned, C.Y. Leung is as good as dead. What little faith the Politburo had in him during the election has completely evaporated. Leung is now widely expected to suffer the same fate as Tung Chee-Hwa and step down as early as next year. Luckily for him, Beijing is unlikely to make any drastic decision until the upcoming National Congress is concluded and the change of leadership has fallen into place. It will be at least another few months from now. But that's little comfort to those who work for him or side with him, for Leung is now radioactive with a 20-mile dead zone. His cabinet members and advisors have started to distance themselves from him, as are pro-government parties like the DAB (民建聯) and the Federation of Trade Union (工聯會). 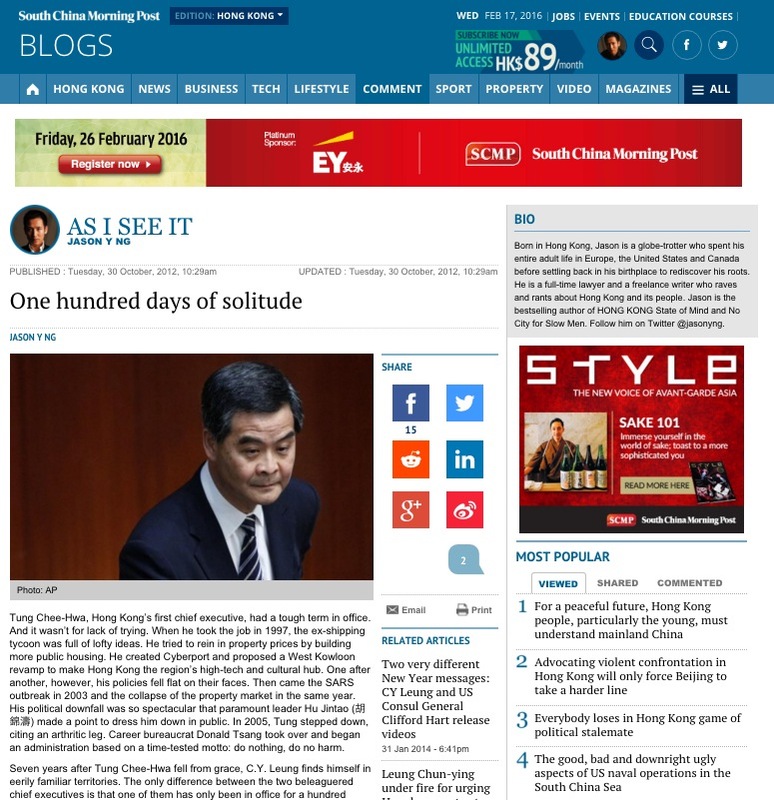 For a man who admits to not having many friends, Leung is feeling even lonelier these days. C.Y. 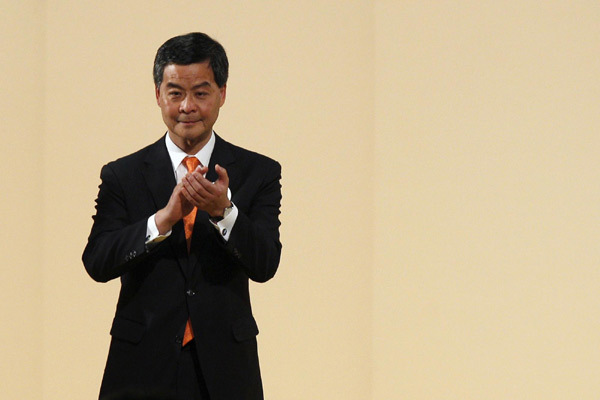 Leung's fall is more than a prediction – it is a forgone conclusion. Sometime in 2013, he will develop a sudden case of arthritis and pass the throne to one of his deputies, Chief Secretary Carrie Lam (林鄭月娥) or Finance Secretary John Tsang (曾俊華). It is unclear whether these career bureaucrats will be any better at carrying out the remaining Great Tasks at Beijing’s behest. What is certain, however, is that Leung’s downfall will deal a death blow to the Liaison Office. They have backed the wrong horse and, worst of all, given Beijing bad advice. 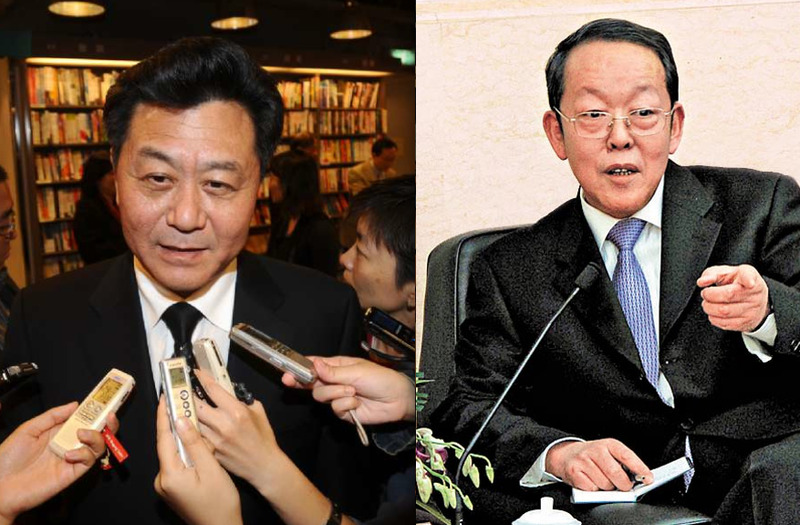 There is a longstanding power struggle between the Liaison Office and the Beijing-based Hong Kong and Macau Affairs Office (港澳辦) or HKMAO, not least because both agencies are tasked with overlapping responsibilities to oversee affairs in Hong Kong. Once Leung is out of the picture, the Liaison Office will be significantly weakened and relegated to the sidelines. But that doesn’t mean Beijing will finally leave us alone and let us run our own city; it just means that we will be hearing a lot more from the HKMAO from now on.